Daily Debate: Is Hyrule Castle from Breath of the Wild a Dungeon? Hyrule Castle serves as the definitive end goal of Link’s adventure in Breath of the Wild. With the structure always lingering in sight as our hero overcomes challenges within the kingdom, we know that scaling its walls and confronting Calamity Ganon will be our final test before saving Zelda. Hyrule Castle is a thrilling, climactic moment; it’s an awesome set piece with great music and a true sense of urgency. And for players that went through the trouble of awakening the four Divine Beasts, this fallen stronghold feels like the culmination of all challenges faced beforehand. But beyond all these descriptions, should we consider Breath of the Wild‘s Hyrule Castle, from a traditional Zelda point of view, a dungeon? Those that have been participating in our ZI Versus tournament will know that this question has sparked fierce debate in the comments. There are some fans that feel that Hyrule Castle should not be classified a Zelda dungeon, as it fails to meet a criteria established by past games. Hyrule Castle has very few (if any) puzzles within its walls; and for someone with enough ingenuity, the entire castle can sidestepped with a few well-placed Gale jumps, some frantic spurts of wall climbing, or certain exploitations of the game’s physics. Surely an area that can be completely skipped in such ways couldn’t be called a dungeon; it’s merely an extension of the larger overworld. Others have argued that Hyrule Castle should be considered part of the dungeon family. While it does act as a departure from the traditional puzzle-focused entries of past games, the castle presents enough challenges to qualify as a dungeon. Navigating the labyrinthine corridors and passageways of the castle is a puzzle in itself, with the castle presenting several potential solutions to that puzzle. And if a player decides to the burrow through the fortress’ insides or fight through its battlements, he or she might be reminded of the great gauntlet dungeons of old. The fact that a holographic map appears when the player is in Hyrule Castle also helps to support this perspective. This debate is far from over, as there are strong arguments on both sides. Where do you stand? 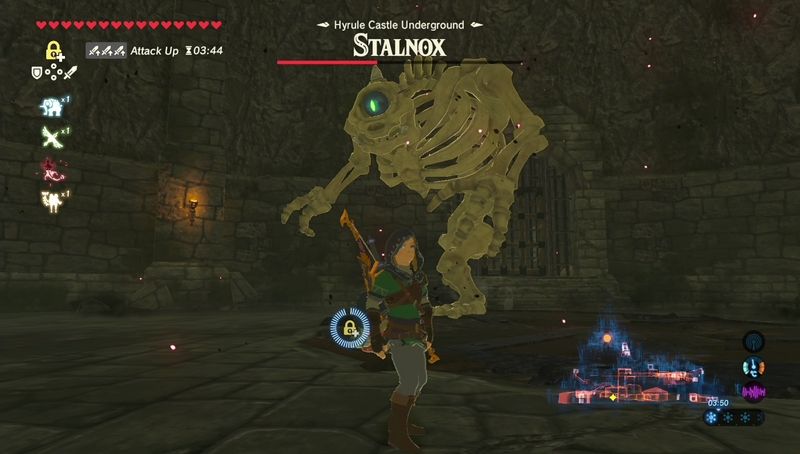 Is Breath of the Wild‘s Hyrule Castle a dungeon? Or should it discounted as such? Let us know in the comments below!